Typography is perhaps one of the most overlooked aspects of e-learning design. As Paula Scher said, in a recent episode of Abstract on Netflix (watch this series, it’s interesting), “Typography is painting with words”. Typography can set a consistent tone across an entire project, something that allows for the rest of the project to follow suit, almost like a “creative central nervous system” of sorts. 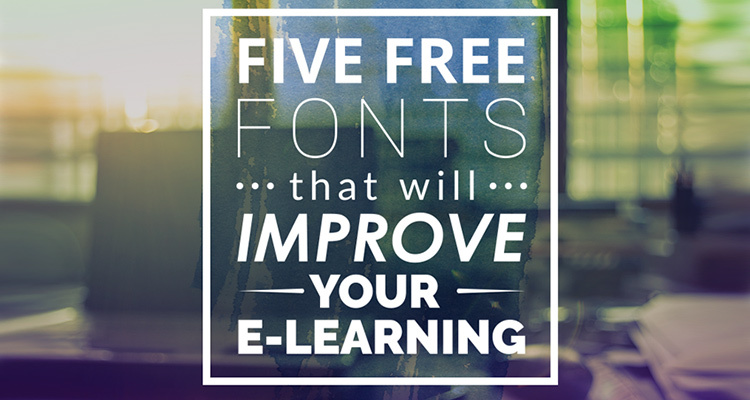 And to produce great typography in e-learning, you need great fonts. But it’s almost overwhelming to consider finding something you might like online nowadays, let alone finding something that is aligned to your specific function in e-learning. But we’re here to help with that, we’ve collected a handful of fonts that we believe e-learning designers cannot work without. Some TTRO designers have given me their input, about which fonts they think should be in the list below. These five typefaces are the ‘gold bullion’ in any good designers’ font-vault. But unlike gold bullion, these are all available, for free, on Google Fonts. Lucky us! Our Master of All Things Photoshop, Stephen Green, named it, “Good ol’ Open Sans”. A reliable and trustworthy font, Open Sans has come out on top on this list. It is an example of an extensive font family, suitable for many needs and aesthetics. It comes in a wide variety of weights and forms, which means creating hierarchies – headings, sub-headings etc. – is easy and interesting. Its impressive legibility makes it useful for use in content and large headings, or typeset pieces. The second font on this list is another sans serif – yes, there is a trend here* – Roboto. There are some other forms of it (a very nice slab serif) but the single-named version is what we’re looking at. It’s punchy, with a formal seriousness to it, which is a plus. Like Open Sans above, it’s offered in a comprehensive set of different weights, which increases its versatility. These fonts are essential to good e-learning design, their legibility and neutrality is what makes them so attractive. I had to really restrain myself from joking about how Lato does not have a problem with punctuality, but I thought better of it. You’re welcome. Like Roboto and Open Sans, Lato also has a variety of different weights, but loses some quality in its italics, particularly when the font is quite small. However, Lato’s strength lies in its heavier weights and its regular form. It’s a well-kerned and versatile font. Century Gothic is a Windows system font, but unlike some of its other 1994 Microsoft siblings, Century Gothic has turned out like a well-matured wine and hasn’t lost relevance. It’s also great for print work, and in fact, our blog and our website – yes, the one you’re reading right now – is presented to you in this capable font. As probably the most “boutique” font in this list, Raleway’s greatest strength is best displayed when it’s used for big bold headings and typesetting pieces. Like Lato, Raleway’s legibility is impacted when presented in large paragraphs, particularly in the lighter weights or when italicised. But I know others will disagree. Overall it has a geometric quality to it – the way the ‘W’ intersects in the centre for example – that I find very pleasing. These fonts are essential to good e-learning design, their legibility and neutrality are what makes them so attractive. Legibility in the sense that they read well on monitors and digital devices; and neutrality in that they aren’t as closely associated with print as the usual graphic design suspects – excepting Century Gothic, obviously. This is because they are all quite young fonts, designed specifically with pixels in mind and not ink. *Sans serif fonts are predominantly preferred in digital design, as legibility is a great concern when it comes to choosing a font, and many serif fonts don’t deliver on that aspect. There are however a few serif fonts that do have high legibility in digital design, like Droid Serif, or Source Serif Pro.